There are already the craziest competitions out there. Whether it is mobile phone throwing, wife carrying ... and, of course, there are also, competitions involving gumboot throwing. That got me the idea to think about what other games are possible. 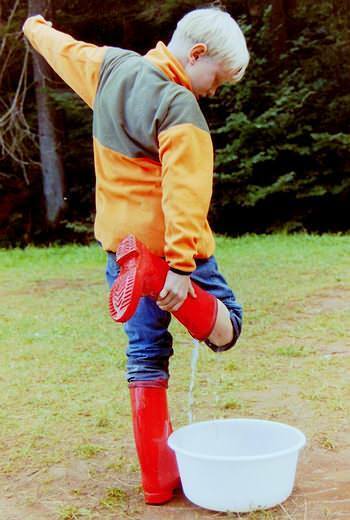 Needless to say, gumboots are standard equipment in every camp. Gumboots do not cost the earth, they are virtually indestructible and you always find use for them. Purchasing a pair for your toy box is certainly worthwhile. They can be used for all the games below. The following games can be carried out by relays, races, station games (play street, children's festival, school festival) or a Camp Olympiad. With these gumboot games, everyone can have fun and for some of them you indeed will need some skills as well. Using your hands, to throw the boot as far as possible. The longest throw wins. Loosely put the boot on your foot, trying to throw the boot as far as possible away from you. Measure the distance from the start line to the point where the boot first touches the ground. Create an obstacle course or a longer race in the open terrain with different stations. The player has to go through this course. He throws the boot from one station as close as possible to the next station, picks up the boot and throws it again. The respective stations pose additional tasks for the boot throwers. For example, he has to throw the boot over a branch and has to climb over the same as well. Or you have to throw the boot in a basketball hoop. Only after you succeed, you can continue to the next station. Alternatively, you have to throw your boot through a lower hanging tire and crawl through afterwards. Only then you are allowed to continue. There are many other possibilities for you to explore. You can judge a) the number of throws, which is needed for the entire course or b) the time you needed to get through. The rating also depends a little on the difficulty of the course. The boot is on the ground and using your foot you kick the boot as far as possible. Measure the distance from the start line to the point where the boot first touches the ground. For this game, you will need the biggest boots available. The bigger, the better and the funnier. Now put on your oversized “seven-miles gumboots”. Every candidate has to cover an obstacle course where he is timed or, alternatively always two kids can race against each other. If you play this game in a kindergarten, do not use the largest boots. After all, we do not want children to disappear in the boots. Such a race, of course, you also can play as a relay: put on dungarees, or buckskin pants, and not to forget your gumboots and start running. Then take off the rubber boots, buckskin pants and pass them on to the next runner. If you do not have several outfits, the candidates can run one after the other and are timed. Objective, from a distance the boots are thrown into a target circle. The closer your boot gets to the centre of the circle; the more points you get. If it happens that your boot comes to stand upright, you will receive extra points. Put on your gumboots and step into the creek. Alternatively, you also can step into a water tub or fill the boots up using a cup. With your water filled boots run a certain distance to another bucket and fill it up with the water of your boots. However, do not take off your boots. You will be surprised; it is not all that easy to get the water in the bucket. The team/candidate wins, who first fills up the bucket with water. Alternatively, you could measure how much water is in the bucket after 5 mins. Water fights with gumboots. The boots are filled with water. Next you try to drench your opponents with water. However, be careful, because the boots must not be thrown. If you drop the boot during the game, you are disqualified. From a distance of 2-3 meters try to fill the boots using a water gun. If you have a garden hose, you can use this to fill up larger boots. But beware: if the boots fall over you will no longer be able to fill it up. If you use small water guns, it will take a little bit longer to fill them up. You can always shorten the distance to the boots or alternatively, using a measuring cup, work out how much water is in the boot after 1-2 mins. Rubber boots Rugby is a game for the warmer weather. Many kids from every age group can join in. All they need is their own pair of rubber boots. Every meadow makes for a great play area. Now, collect all the boots from the kids and put them together on one big heap. The kids stand within a reasonable distance. On command, they start to walk barefooted towards to boots. The objective is to find your own pair of boots and return to the starting point. While they are trying to find their boots, shoving and wrestling is allowed. However, they need to stay focused on the actual aim of the game. Sent in by Joachim O. This rubber boots game is a variation of the SUV Trial sport. All you need are brooms, a hammer, several pairs of rubber boots and a watering can. Furthermore, you need a hilly terrain. If nothing else is available, a slope will do. Task: Every participant has to crawl through an obstacle course on his hands and feet while wearing rubber boots on hands and feet. The obstacles are built with the broomsticks. The objective is, not to be the fastest, but getting through the course without any errors. You will earn penalty points if you sit up, touch the broomsticks, run backwards. You can use the water from the watering can to make the obstacle course a little bit harder. The winner is the one who makes it through the course without any mistakes. For this game, you will need 10 different pairs of rubber boots, in 10 different colours. The participant can look at the boots for a little while to memorise their nature. (size, profile, colour, texture, right / left boot). Then he will be blindfolded. Now he gets one minute to guess the colour, size, etc. of the boot in his hand. The winner is the one who gets the most things right. If the boots have all the same colour, then you can put numbers on them, and instead of the colour, they have to guess the number.